Last year I did a post about Whitney Cummings (C'03) being one of Entertainment Weekly's "12 Future Stars of Comedy". As you'll see in the above preview clip from this Sunday night's Friar's Club Joan Rivers roast, it is apparent why Whitney was given this title! The video above is hysterical and definitely a not-safe-for-work video ...and Whitney pulls no stops when it comes to Joan's face! Check out my other Funny Friday posts HERE! More of my not-safe-for-work posts HERE! Last week I did a post on Hollywood-guy-to-watch-out-for Jonathan London (C'01, WQHS Radio, The Hollywood Club). And now a fun follow-up! In that post, Jonathan talked about how he "shot a film for school called Gay By Dawn (featured in Pennfest 2006 - program HERE, photos HERE). It was a comedy horror short and it played really well at festivals for about two years. I knew it played well with festival audiences because it was weird, but just kept sending it to any festival that would take it and was shocked that it lived so long." Well, we have it now to show on DT and it is funny! "In the deep, dark woods, four rednecks tell ghost stories around an open fire. But when one tells a tale about the horrors that may lurk around them, fear becomes suspicion. Will they make it out in time? Or will the very woods around them turn them Gay By Dawn? Finally! Gay By Dawn is here! Four rednecks discover the true nature of terror in this multiple award winning comedy short." 450 Pound Stainless Steel Coffer Buried in Quad - To Be Opened in 2040! 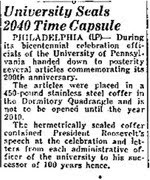 Did you know that there was a Time Capsule buried in the Quad in 1940? Anyone know where in the quad this was buried exactly? 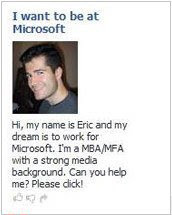 Eric recently graduated from an MBA program and to try to get a job, he bought Facebook ads that specifically targeted employees of Microsoft, Apple, Netflix, Youtube and IDEO. It cost him a little over $100, and so far he's gotten help from Microsoft employees and other companies who like his tactics. "Barker, a former Hollywood screenwriter with an MBA, said his Facebook campaign has cost him little more than $100. He's targeted ads to Microsoft, Apple, Netflix, Youtube and IDEO -- basically companies that are in media. He's gotten contacts and interviews, ironically, with other companies who were impressed by the ad. He said he "went nuclear" with the Facebook approach because of the rough job market and he needed to get attention quickly. "My background is in Hollywood," he said. "Nothing in Hollywood gets done effectively through formal channels. Everything is done by friend of a friend and reputation. The real world is not that much different." His dream job would be something in product marketing and/or development, he told me. About his Facebook approach, he said: "We're all marketers now, like it or not. Getting access [through the Web and interactive social media tools] is easy. It's now all about marketing and branding yourself." Eric also used DuelingTampons.com to get in touch with alumni for leads. Learn how he did that HERE! His Green Products Are In Over 5,000 Stores Nationwide! In late April, I featured a TV News clip of Brian Yanish (C'95, Mask and Wig, Friars) talking about his Scrap Kins children's character property. 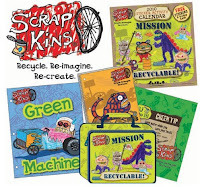 For all of you with kids out there and are doing some back to school shopping, Brian's "The Scrap Kins" recycled paper stationery is already on shelves in your neighborhood. His pocket folders feature "Green Tips" on the back and his spiral themebooks give instructions for a recycled craft project kids can make using recyclables found at home. Support Brian by choosing "Green" for your back to school supplies. Rite Aid (They're also carrying Brian's soft lunchboxes). Brian's limited edition stationery is only in stores for a Limited Time through Labor Day, so get these collectibles before they're gone! And this just in! Scrap Kins Recycled Plush dolls (made from recycled polyester (fabric spun from plastic PET bottles (soda & sports drink bottles) are planned for release in Spring 2010. Congrats Brian! Comedienne Lesley Wolff (C'93, Bloomers) was recently featured on HGTV's "Buying and Selling: 20 Best Secrets". Watch Lesley put her comedic spin on these secrets in the video clip above.